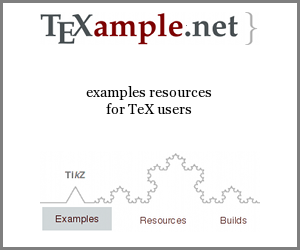 I am trying to customize my themes, but also would like to use hyperref to get quick links for ease of navigation. However, hyperref seems to replace the color of all contents to its linkcolor option. 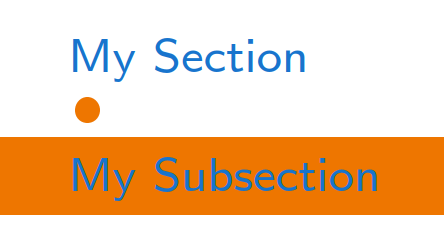 The MWE shows that the section and subsection titles colors are blue but I actually sat them to orange and white. The answer in Changing hyperlink color changes beamer section header colors proposes not using \hypersetup, but I would like to use it anyway because colored equations referencing makes it easier to find equations quickly and see where they are used in text. Can I enable link coloring as normal but exclude sections and subsections? Not the answer you're looking for? Browse other questions tagged beamer hyperref color or ask your own question. 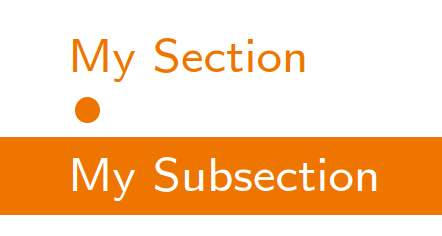 How to prevent Beamer from changing the normal text color when I change the footnote color? How to prevent hyperref package from changing layout (line spacing)?